Yesterday Belarus officially declared that it would not extradite the former head of Kyrgyzstan's security service Janysh Bakiev. That was the State Prosecution Office's response to an extradition request from Bishkek. Kyrgyzstan accuses Janysh Bakiev of committing a number of violent crimes. Minsk calls Kyrgyzstan's request politically motivated. On 17 August, Belarusian activist Mikhail Pashkevich took a photograph of a Kyrgyz man near a restaurant thinking that it was the former Kyrgyz president Kurmanbek Bakiev who has been living in Belarus since April 2010. The Kyrgyz government have tried – without success – to bring him back to prosecute him for crimes committed during his time in office. However, the man in the picture has been subsequently identified as Janysh Bakiev, the younger brother of Kurmanbek. Two other Kyrgyzstani citizens sought for crimes in their home country were with him. That triggered a serious diplomatic scandal between Belarus and Kyrgyzstan, the recall of Kyrgyzstan's ambassador and an attack on the Belarusian embassy in Bishkek. Kyrgyz authorities reacted immediately. Already on 21 August Kyrgyzstan Foreign Ministry handed to the Belarusian ambassador a note demanding the arrest of Janysh Bakiev. The next day the Ministry of Internal Affairs of Kyrgyzstan explained that the individuals in the picture are accused of killing among others the former head of presidential administration of Kyrgyzstan. Belarusian authorities then denied Janysh's presence in Belarus. On 24 August, the Kyrgyz ambassador to Belarus was recalled to Bishkek. Belarus decided not to respond in kind and kept its ambassador in Bishkek. Minsk apparently wants to soften the crisis. On the same day, Pashkevich, who photographed Janysh Bakiev, told the media that some suspicious people were following and threatening him for revealing Janysh's location. On 28 August, Kyrgyz protesters threw stones at the Belarusian embassy in Bishkek and tried to storm the building. Kyrgyz police explained that this is how Bakiev's victims were protesting Belarus' actions. On 3 September, the Kyrgyz president recalled his country's ambassador to Minsk. It is now clear that the Belarusian government was aware of Janysh living in Belarus and apparently helped him to hide in the country. Such harsh reaction to the revelation of Janysh Bakiev's whereabouts contrasts with Bishkek's silent tolerance of the former Kyrgyz president's presence in Belarus. Kurmanbek has been openly living in Belarus for years, where he has reportedly bought a USD 1.7m mansion and taken up citizenship. Sometimes he holds press conferences and invites journalists for tea at his house – without actually allowing anybody into his house. He reiterated that he was paying for everything out of his own pocket without the Belarusian government's help. Relations between the two nations continued despite sporadic ritual demands for the former president's extradition to Bishkek. In October 2011 high-level Belarusian officials even attended the inauguration of the new Kyrgyz president Almazbek Atambayev. On 5 July, Kyrgyzstan withheld its vote for a resolution of the UN Human Rights Council on the human rights situation in Belarus. The new Kyrgyzstani government had more important business to attend to and was too weak to deal with the former president. Actually, the Kyrgyz government might easily let Kurmanbek stay in exile, as his return would bring no real benefits for the new regime. Moreover, Kurmanbek was considered to be under the strong influence of his brother Janysh and son Maxim – the main villains in Kyrgyzstani public opinion. Janysh was responsible for the security services and gave orders to shoot at protesters. The current Kyrgyzstani authorities even set a prize for anyone providing information on the whereabouts of Janysh. Some analysts believe that Lukashenka has helped out Bakiev and his retinue out of personal, apparently emotional motives. The Belarusian ruler considered it necessary to give refuge to the ousted “fellow dictator” and give a signal that he would also – like Bakiev – without hesitation crush protests. But this may be only a part of the real explanation. A more rational scheme, however, may be behind bringing Bakievs to Belarus. In its relations with Russia, Belarus has a constant problem of disproportional forces. To compensate for its own weaknesses in this relationship, Lukashenka has worked on building up relations elsewhere and finding allies to counterbalance Moscow. His major partner among post-Soviet nations is Kazakhstan's president Nazarbayev. Minsk paid for that cooperation when it solved for Nazarbayev his “Bakiev problem”. After his flight to Kazakhstan in April 2010 Bakiev became a doubtful asset for Nazarbayev. The fugitive leader and his team were eager and able to wreak havoc in Kyrgyzstan. A few weeks after Bakiev was ousted, his supporters instigated massive bloody inter-ethnic clashes in the southern Kyrgyz province of Osh. Nazarbayev hardly wanted to see a destabilised Kyrgyzstan on his borders. And he was happy to send Bakiev thousands of miles to the west, to Belarus. The extradition of Kurmanbek Bakiev is very unlikely. Kyrgyzstan has no leverage to force the extradition, and Russia and the US just wanted him to go and have no interest in his prosecution. The same is true even for Janysh. Bishkek believes to have enough evidence to build up a case against the former security service chief. It guarantees a fair trial and asks for help both from the CIS and Interpol. 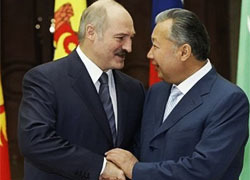 Yet both have limited influence on Belarus. Belarusian authorities may also have a mercantile interest in keeping the former ruling clan in the country. Bakiev's son Maxim has been staying in the UK since 2010 – though officially he still does not have political refugee status. The charges against Maxim are not lighter than those against Janysh. In the past, many speculated that Saddam Hussein and Muammar Qadhafi would find refuge in Belarus. None of them ended up in Belarus which could have saved their lives. The feeling of solidarity between dictators coupled with the money which they have bring could yet again make Belarus a potential safe haven for fallen dictators from around the world. The 2012 Olympic Games brought little happiness to Belarus' team: not matching even half of their expectations and receiving the fewest medals ever. This means trouble for Lukashenka’s plans to restore the image of Belarus’ overall prosperity thanks to athletics. Yet during the Games, the disappointed President promised tough showdowns for Belarusian sports state authorities. The bitter impression made on Belarusians by the Olympics only worsened once they were over. 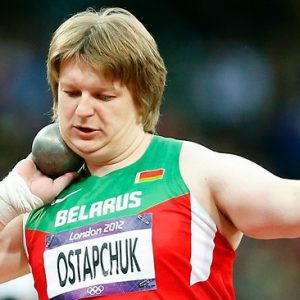 On 13 August, the International Olympic Committee stripped Belarusian shot putter Nadzeya Ostapchuk of her gold medal because she failed a doping test for the anabolic agent metenolone. Ostapchuk denies the accusation. Twelve medals for a country with a population of 9.5m is not really a bad result. Belarus’ current GDP and corruption international rankings are far more frustrating. However, for some reason the 2012 Olympics caused an unfavourable resonance in Belarus. The first and simplest explanation is that Belarusians expected more from their countrymen. The grounds for great expectations first appeared in March 2012 when Alexander Lukashenka raised a very high bar for the Belarus team at the Olympics. He wanted them to win 25 medals. Sportsmen and coaches noted the unlikelihood of such an achievement, but the president insisted that the calculation was “iron”, and “that it will be a great surprise if we do not get our medals”. Later the same figure was announced by the Minister of Sports and Tourism and little by little flooded the Belarusian media. Lukashenka’s ambitious plan turned out be what everybody had expected. "The president said – the people achieved" is a working scheme for any authoritarian country, though only when the results avoid external and unbiased evaluation. The Olympics have acted as a touchstone for Belarusian sports. 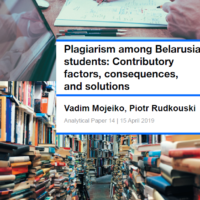 They showed that it is not only the planned economy that does not work: The Belarusian team’s overall medal standing was worse than ever before. In contrast to this year’s 12 medals, the country earned 15 in Atlanta, 17 in Sydney, 19 in Athens, and 15 in Beijing. Depriving Nadzeya Ostapchuk of her gold medal was the final blow inflicted on Belarusians by the Games. According to the International Olympic Committee, Ostapchuk’s samples taken in early August showed the presence of metenolone – an anabolic agent forbidden by the rules. The sportswoman does not accept her guilt and hopes for a change in the verdict. The accusation is indeed questionable. Several months before the Olympics Ostapchuk passed a number of doping controls: twice in May, three times in June and twice in July. The last testing took place on 30 July in Cologne. All results were negative. Consequently, in order to have metenolone in her samples Ostapchuk must have taken it after 30 July. At the same time, as the Director of Belarusian National Anti-Doping Agency authoritatively claims, there is no point in taking this particular drug on the eve of the competition. It becomes effective only over a longer period. Nadzeya is going to challenge the International Olympic Committee’s decision. The experience of Ivan Tsikhan and Vadim Devyatovskiy has proved that appealing such verdicts can be successful. The two Belarusian athletes were accused of taking banned drugs and deprived of their medals. To restore their rights, Tihon and Deviatovsky referred to the Court of Arbitration for Sports. In 2010 the case ended in the withdrawal of the accusation to both athletes and they solemnly got their Olympic medals back. Whether the same happy end awaits Nadzeya is difficult to predict. In any case Belarusians are eagerly waiting news on her case. Among the thousands of Belarusian authorities’ convictions inherited from the USSR is that “the Olympics are like military actions, but during peace time”. While Lukashenka has only implied this, the Minister of Sports and Tourism voiced this statement to the sportsmen explicitly. Indeed, such a perception of the Games by the more senior Belarusian sports officials is comprehensible. Superpowers’ athletic confrontations were one of the remarkable aspects of the Cold War. Mutual boycotts of the Olympics in Moscow and Los Angeles by the Soviet Union and the USA in 1980 and 1984 and more than 40 years of tough rivalry have left a deep mark on Soviet – now post-Soviet – minds. The 21-year-long sovereign history of Belarus could not eliminate these stereotypes, particularly in the context of strained relations between Belarus and the West. On the other hand, the fanatic Soviet attitude to sports has worked in Belarus' favour. Vitaly Sherbo, Olga Korbut and Aleksander Medved are still evidence of sports' contributions to Belarusians’ national pride and patriotism. Even now eight out of the 12 medals won were won in Soviet Belarus’ traditionally successful sports: weightlifting, shooting, sprint canoeing, and gymnastics. Unfortunately, this year’s results suggest that the positive heritage of the USSR fades more quickly than the negative one. Belarusian authorities still view sports as a part of a bigger political picture, as a chance to confront the West. Lukashenka said that sports are "dirt and corruption in all directions" soon after he was denied a visa to attend the Olympic Games in London. Time will show whether the Belarusian authorities will be able to go beyond viewing sport as merely a geopolitical tool.